Backup is an extremely imperative thing on an everyday basis – be it as small as a phone’s data or as big as a website’s data. If losing even your phone’s data can cause you to pull your hair out from the roots, then just imagine what level of frustration you could get if any data of your business/website gets irrecoverable! This can happen when you don’t back up your data on a regular basis. Also, the number of increasing online attacks can cause your data to evaporate in the air in seconds! Almost every day, we hear the news about a high-profile website getting crashed. You can prevent your website from crashing by having someone to look after its security and periodic backups (preferably everyday backups). Latest reports predict that the number of website attacks had cost the US $28 billion in 2016 and the figures are going to increase in the coming years. Considering the report of Juniper Research, the average cost for data breaches is going to exceed up to $150 million by 2020. And, in 2019, businesses are going to lose over $2 trillion (4 times than that of the cost in 2015)! Such cases happen very frequently and hence; backups play a key role in deciding whether you rise up again from the ash like a phoenix (recover from the attack or hardware/software failure or not). This website backup guide has got your back as it is going to help you in knowing the process of safeguarding your data files and database. Let us start with the vital reasons to know the severity of backing up your website regularly. Now, as per the facts about cyber threats told above, you must have got what I’m talking about already. Any perfect looking link can be a hacker’s trick to unlock the access to your website and hack it. There are literally hundreds of ways to hack a website. A hacking attempt can be for anything; right from stealing the credit card details, some sensitive information, to mere proving that he/she can hack a website. Any website which is not secure and has too many loopholes can easily get compromised to attacks. Regular backups and security measures can protect your site. You must have saved the copies into your personal machine but, what will happen if your machine crash at an unexpected hour? There are even thin chances of theft. Keeping backup at a remote location is a more convenient option in case of such failures. We generally consider that updates of everything are a better version than earlier ones but, sometimes the situation can go wrong. The new update of themes, plugins, and software may introduce a new bug which can result in lost data. It may also lead the website to go offline or deteriorate the look. There exist ‘n’ number of viruses, malware, and bugs which can cause a downfall of your website. These can enter in your system through various ways – either a third-party application/site or direct attacks through malicious scripts. You can unknowingly download these infected files or codes when browsing or downloading a normal looking application, plugin, or theme. They can creepily come in your site through breaching the firewall. Everyone can make mistakes. Deleting an important file by mistake or accidentally clicking a button which should not have been clicked is quite possible. One day, you just casually go to check your website and see an error on the page. What can you do now? But, having yesterday’s backup can make you feel glad and you can find out the cause of the error later. You will save yourself from a lot of stress because you have a backup. Such situations don’t come up be informing us, they just bang on your face. So, you have to be equipped. 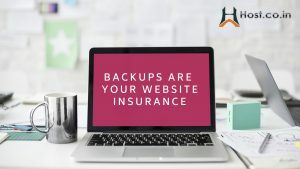 Looking at the above reasons, you must be convinced that taking regular backups of your website is a crucial thing for your business. Now that you consider backing up your website, get on to know some ways to do it in the right manner. Confirm with your web host provider if he offers backup service. Today, you can get almost anything as a service. Get in touch with the people who designed your website and ask if they can also provide backup. They must know about the working of content management systems so that they can handle the backups of your files manually too. You can still use the “Plan B” backup service, just in case, the first one doesn’t work. Some research can help you find such services easily. Some are certainly cost-effective but some provider more user-friendly software. You have the option to decide whatever you want. Installing a backup plugin on your website is an intelligent way to keep a track of backups. Some plugins are intelligent enough to automate the backup schedules. You can also take help of the cloud-based storage services. Compression of files is a boon when you have a large amount of data. You can do the same and email to yourself the zipped folders. Of course, this is the best option for small websites. If your email service provider doesn’t allow you to send the data beyond a certain size, then you can chuck them up and email to yourself. But again, this can create confusions. After all, the size of your site will expand and this is just a temporary option. Saving a copy or two on your computer is not banned even if there is a risk of catastrophic failure. You must keep backup on your local machine as well and update it on regular basis. Local machine backup is never a bad idea and it can come handy when other options fail. It doesn’t cost much (time wise and money wise both) to take advantage of backup services. Whatever amount of money and time you put into the backup service is anytime less when compared to the loss and frustration that happens when you desperately need a backup. So, avoid tension and being anxiety-ridden by following these various backup ways. Nowadays people prefer backup and disaster recovery as a service more than any other option. Plus, having a “plan B” is always a good option. You can prevent the unwillingness of restarting your website by always setting the ‘backup mode on’. Stay at peace by having regular backups.